Thanks to the folks at Tyrrell's Chips for providing their products for this review! When I get snacks for my family, I'm always looking for ones that are at least somewhat healthy. I prefer that they don't have unhealthy oils or unpronounceable ingredients. But most importantly, they have to be delicious! So when I heard that Tyrrell's Chips, made with all-natural ingredients and healthy oils, were coming from their native England to be sold in the United States, I had to give them a try! Tyrrell's Chips are made from potatoes grown from local farmers. The potatoes are thick-sliced with the skins on, hand-fried in small batches, and then coated with a shake of their all-natural seasonings made from top-notch ingredients. This makes for an amazingly great snack! I was given seven full-sized bags of their great flavors to try. I was delighted to see the whimsical packaging of the potato chips! There are old-time photos on each of them, with a caption contest advertised on the back. Each bag had a funny slogan as well. They made us smile while we ate the chips, and eating them made us smile even more! The first we tried was the Lightly Sea Salted variety. I figured we should try the basic variety before trying other flavors. But basic they were not! They were kettle-cooked chips, thick and natural. They were only lightly salted, so they tasted of potato, not salt. They had a nice crunch to them. And there were very few broken pieces. I could have eaten the whole bag right then and there! The only ingredients in the Lightly Sea Salted chips were potatoes, sunflower oil, and salt. That's it. They're gluten-free and vegan-friendly. But if you'd like just a little more to your chip, the Sea Salt & Cracked Black Pepper chips are just like the Lightly Sea Salted except for the addition of the black pepper. It made for a slightly spicier, but still delicious, chip. The next day, we decided to try out one of the chip flavors. I picked the one that most appealed to me, the Sweet Chili and Red Pepper chips. Ingredients: Potatoes, sunflower oil, sugar, natural flavor, onion powder, salt, tomato powder, garlic powder, cayenne pepper, parsley, jalapeño chili pepper, white pepper, natural color (paprika extract), ginger, star anise, basil, red pepper. If you can only try one kind of Tyrrell's Chips, I would definitely recommend the Sweet Chili and Red Pepper! A couple of days later, I invited some friends over to sample the rest of the chips. I knew I loved them, but I wanted to get other opinions, too! We all loved the Mature Cheddar & Chives chips. The cheddar was understated, and the chips weren't overly cheesy. The chives gave a great bite! The Sea Salt & Cider Vinegar variety reminded us that we were eating English potato chips! These would be great with a piece of fried cod. They definitely had a strong taste of vinegar, so if you're not a fan of sour foods, these wouldn't be for you. But my youngest daughter loved them. Another English-flavored chip was the Worcestershire Sauce & Sundried Tomato variety. These reminded some of the tasters of barbecue-flavor potato chips, but a more refined flavor. They weren't overly salty or greasy. Definitely another great-tasting chip! In a different category of chips were the Veg Chips. Instead of being made from potatoes, these chips are made from beetroot, parsnips, and carrots, with a pinch of sea salt. We found these chips to be different, yet also delicious! They were a bit on the sweet side, though. Still, they would make a very healthy snack for kids! 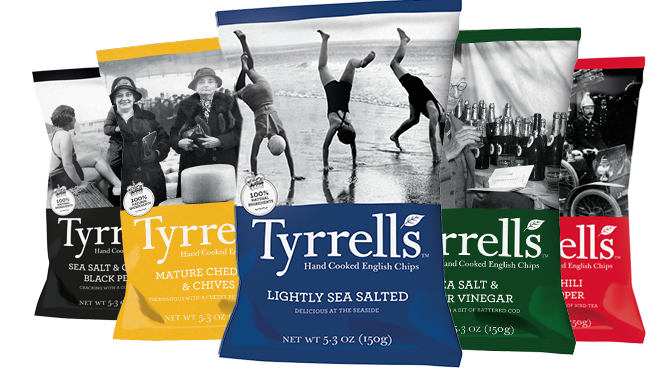 I loved trying all of the varieties of the Tyrrell's chips. I can't wait to get them again! Would you like to try Tyrrell's Chips? Check their store finder to find them at a store near you. Or you can purchase them online either as single bags or in packages of 8. I really loved Tyrrell's Chips, and I know you will, too!